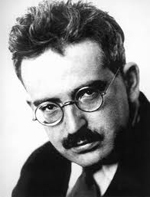 Syracuse Symposium continues its theme of “Memory-Media-Archive” with a two-day conference on the impact of the 20th-century German philosopher and social critic Walter Benjamin. Titled “Memoryscapes and Imageworlds: Archive, Architecture and Media after Walter Benjamin,” the program runs Oct. 31-Nov. 2 at Syracuse and Cornell universities. It is free and open to the public. For more information and to register, contact Karl Solibakke, associate professor of German at SU, at 315-443-5823 or ksolibak@syr.edu. The registration deadline is Friday, Oct. 26. “Memoryscapes and Imageworlds” is organized and presented by the SU Humanities Center for The College of Arts and Sciences and the campus community. The conference is sponsored by the Central New York Humanities Corridor, funded by a grant from the Andrew W. Mellon Foundation, and is presented in conjunction with “IMAGES? Precisely!,” a Transdisciplinary Humanities Project involving the SU Humanities Center and School of Architecture. Benjamin (1892-1940) was a German-Jewish essayist who wrote extensively about technology, language, literature, the arts and society. Although he left behind a large amount of unfinished work, much of it has been published since the 1980s and has elicited considerable commentary. His most famous essay is “The Work of Art in the Age of Mechanical Reproduction” (1936), which continues to influence media theory and the study of film, architecture and art criticism. The conference will focus mainly on another seminal work of Benjamin’s: “Passagenwerk” (“Arcades Project”). A collection of writings about city life in Paris, it is regarded as one of the leading examples of 20th-century cultural criticism. “Memoryscapes and Imageworlds” is co-sponsored by The College of Arts and Sciences’ Office of the Dean, as well as Graduate Programs at Syracuse Architecture at SU; and the Department of German Studies, Institute for German Cultural Studies and Society for the Humanities at Cornell.